Pot Holes – we love em…or do we? Home » Pot Holes – we love em…or do we? The Road Repair Fund is based on miles of road with no account of usage. Surrey’s roads have more traffic than most counties with Guildford town only exceeded by some large cities. 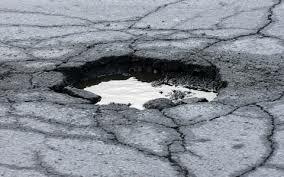 A Fairer Funding Formula will increase Surrey road repair and up-keep budget. Use https://www.surreycc.gov.uk/do-it-online/report-it-online to report Pot Holes in Surrey. The Surrey County Council (SCC) page indicates if the pothole has already been reported and if its repair is scheduled. Other reporting systems currently do not interface to the SCC system following a change in the SCC system. We have requested SCC investigate and report back, as there are many systems in use including the CUK/CTC “Fill That Hole” app and the Surrey Police web page; Google “surrey pothole reporting”. If you report it, there is more chance it will get fixed, and the SCC Cabinet Member for Highways has agreed to prioritise potholes that affect cyclists. https://www.surreycc.gov.uk/your-council/complaints-comments-and-compliments/insurance-claims-against-the-council/highways-insurance-claims if you or your cycle suffers due to an unmaintained highway. If the defect has been reported, the claim will be taken more seriously.